enthusiastically interested in empowering young people through social entrepreneurship to create positive social change. She is a Lecturer of Social Entrepreneurship at the University of Florida and in 2005, brought Social Entrepeneurship to UF where she directs the Social Impact & Sustainability Initiative in the Entrepreneurship & Innovation Center. Kristin is passionate about teaching students to use the skills, strategies, mindsets, and competencies of entrepreneurship to create innovative & sustainable solutions to social, environmental, and economic problems locally and around the world. To that end, she created & directed the Young Entrepreneurs for Leadership & Sustainability Summer Program for High School Students at UF from 2007-2016. She believes community service can be transformative and loves partnering with NobleHour, the Echoing Green Foundation's Work on Purpose project, the Unreasonable Institute, SolutionsU, the Greater Sum Foundation, and B-Labs, the organization behind B-Corporations to create opportunities for students. She’s also a member of Florida for Good and the American Sustainable Business Council. In addition to her work at UF, Kristin founded do good well consulting, to help businesses & organizations connect their values & practices around issues related to sustainability, social impact, and CSR; she also specializes in helping changemakers find & create impact careers. When not on campus, Kristin delights in living in a historic home built in 1912. She finds happiness in checking items off of to-do lists, practicing & teaching yoga, learning to climb trees & to standup paddle board, supporting local farmers, reading The Sun, and collecting quotable cards. ... 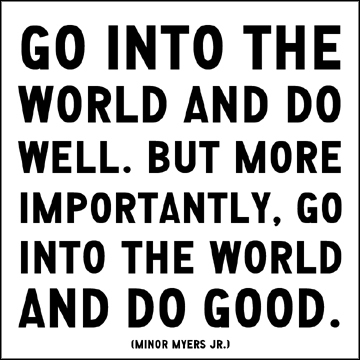 In case you're curious, our name is inspired by these words from Minor Myers, Jr: "Go into the world and do well. But more importantly, go into the world and do good," first seen on this quotable card.